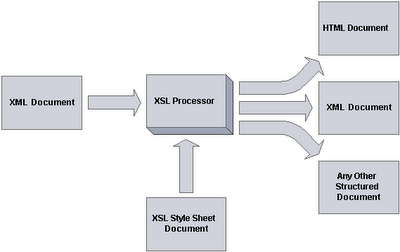 Here, a post to present briefly the recommandation XSL XSLT and some examples. XSLT (eXtensible Stylesheet Language Transformations), defined in the W3C XSL recommendation is a language for transforming XML functional type. It allows to transform an XML document into another format such as HTML to be displayed as a web page. The main objective is the transformation of an XML document to a different schema or format (XHTML, HTML, XSL-FO, etc.). However, XSLT also allows transformations to any other type of document in text format or in binary format (although this is not natively provided by the XSLT recommendation). Given two inputs, to transform an XML document and a XSLT document, an XSLT (XSLT processor) produces an output file in the desired format. XSLT relies on XPath (another part of the recommendation XSL) to designate a portion of an XML tree. The action to be taken upon a successful match in the content of the template. This is the most important tag of XSLT. It is thanks to it that the transformation to perform is defined. This tag allows to replace all parts of the XML document corresponding to the XPath expression by the contents of the tag. This tag will be replaced during processing by the content of the original document elements selected by the XPath expression. Thus, <xsl:value-of select="person/name"/> become the contents of the “name” son of “person” in the transformation. The contents of this tag will be executed once for all elements of the original document that match the XPath expression. For example, it is possible to browse all elements “person” of a XML stream and extract/display the “name” element of each tag. Placed inside a “for-each” tag, the “sort” tag allows to sort items listed by the “for-each” tag depending on the items selected by the XPath expression. Thus <xsl:sort select="name"/> placed in a “for-each” tag on the “person” will allow to scroll the list of “person” sorted by their names. The contents of the tag will be executed only if the condition is true. Means to the XSLT processor to find templates and apply transformations associated to the elements identified by the XPath expression. If no expression is specified, the processor will look for templates for all current the elements and sub-elements. Warning: If no template is not for an item selected by the XPath expression, the processor apply to this element a kind of transformation “default” which is to replace the element by its content. 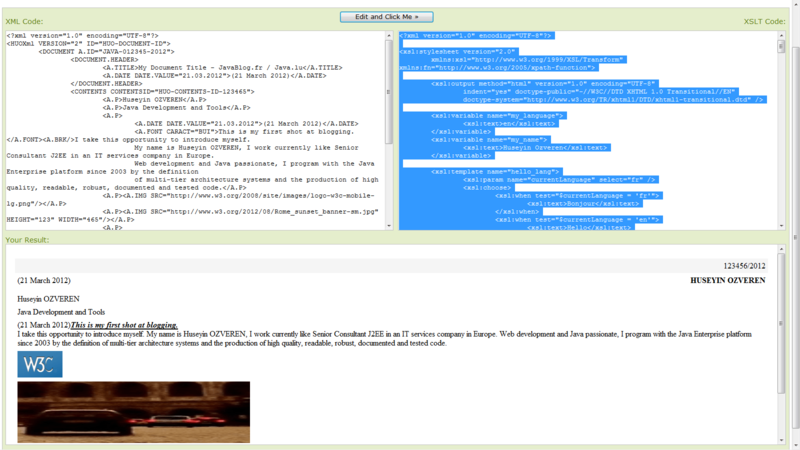 Many other tags exist and can perform complex transformations (see the site of W3Schools http://www.w3schools.com/xsl/). Nevertheless, the above tags are usually sufficient for most cases. There are several implementations of XSLT parsers. In our examples, we use Xalan developed by the Apache Software Foundation. Xalan is in Java, C and Perl and manages XSLT 1.0. 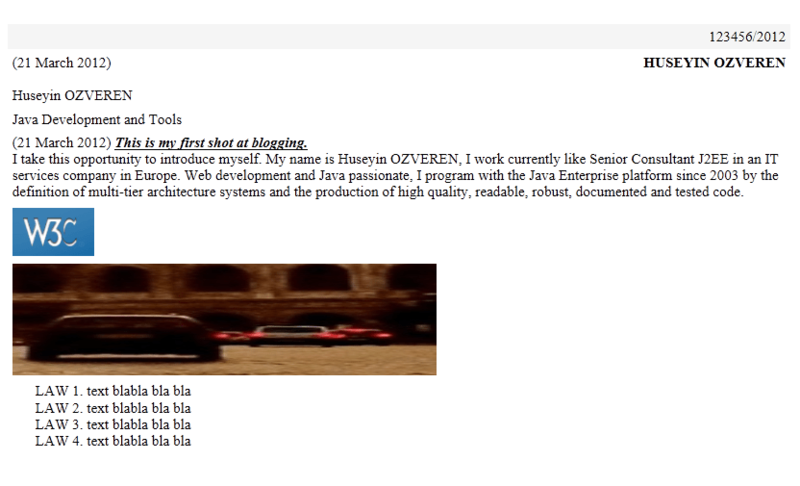 <A.FONT CARACT="BUI">This is my first shot at blogging. </A.FONT><A.BRK/>I take this opportunity to introduce myself. My name is Huseyin OZVEREN, I work currently like Senior Consultant J2EE in an IT services company in Europe. 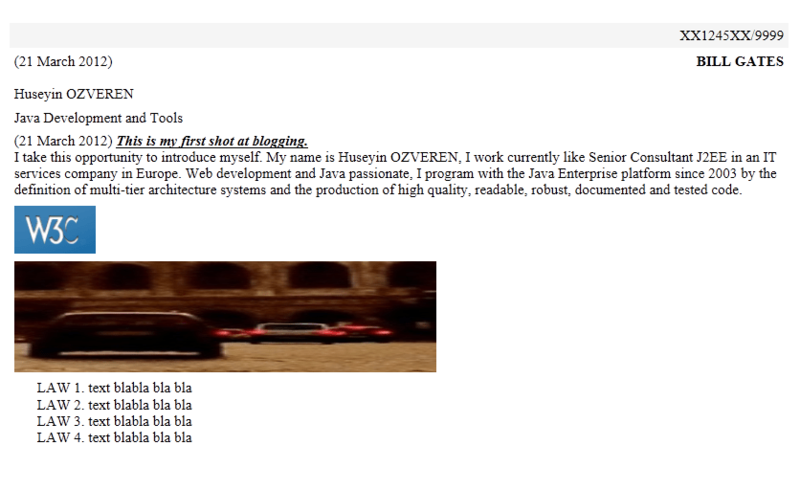 indent="yes" doctype-public="-//W3C//DTD XHTML 1.0 Transitional//EN"
<br>I take this opportunity to introduce myself. …now, these informations will be displayed from the parameters MY.PARAMS.NUMBER and MY.PARAMS.YEAR. In this post, I have presented briefly the recommandation XSLT of XSL with the XSL processor XALAN to create HTML from XML stream and XSL stylesheet. More, I have exposed examples with/without parameters passed from XSL processor to XSL stylesheet.